We offer you the best app for mother’s day that will help you say“congratulations” to your mother in this special day.This app willoffer you tons of mother’s day cards in order to tell your mom“Happy mother’s day”, definitely one if not the most importantperson in your life.How does this app work? We have created asimple app so you don’t have any kind of problem or question whenusing it.Once downloaded and installed in your device, you canchoose what type of postcards you want to send out. Just browsethrough the different mother’s day pictures we have exclusivelycreated for this important date. Once you find the one you like themost, you’ll be able to share it and send it to her, download it onyour smartphone, set the image as background or even edit the imageto insert your custom text in order to select the mother’s daymessages you want to send out… Main features of “Mother’s dayquotes” app: - You can download the designs you like the most toyour smartphone or tablet. If you want to, you can include them aswallpaper or background.- You can share as many images as you wishwith that special person: your mother. You can do this via socialnetworks, instant messaging apps, SMS or email.- You can also addthe designs of your choice to “Favorites” so you can have yourpreferred happy mother’s day quotes at hand later on.- We havecreated a built-in images editor so you can edit your favoritedesign and customize them with your own texts. This way you cansend custom messages with the best happy mother’s day images. Youalso have the chance to choose the font size, text location andeven color.We hope you enjoy this mother’s day app. If this is thecase, we’d appreciate it if you could review/rate it in a positiveway, this will help us continue updating it with better featuresand new designs. For now, you can find the best sentences for thisspecial occasion, however, if you liked the app and ask us for it,we can also add mother’s day poems. We’ll be looking forward toyour comments/suggestions.Legal notice/Disclaimer:All designs usedon this app have been created by exclusive designers for Reticode,therefore the commercial use of any image included in the programis prohibited without the previous authorization of Reticode.Forsome designs we have used images from public domain since they arenot identified in any way that indicates the existence ofexploitation rights reserved thereon.Any natural or legal personwho was the owner of any images contained herein, may accreditthrough [email protected], committing to the immediate withdrawalof the image after verification, if necessary, ownership of theimage or protected sentence. Mothers Day Photo Frames with 30+ beautiful and high resolutionMothers Day Frames. Happy Mother's Day to you. You want to saveyour happy memories, you want to keep happy moment with yourlove.Mothers Day Frames with features:1. With this application youhas more than 30 awesome frames for mother's day event2. MothersDay Photo Frames easy to use and total freeHope you have HappyMother’s Day! Mother's Day is a celebration honoring mothers and motherhood,maternal bonds, and the influence of mothers in society. 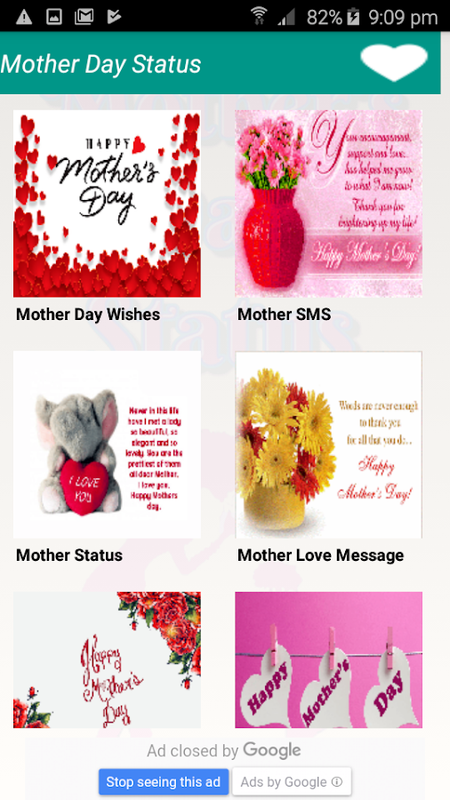 It iscelebrated on various days in many parts of the world, mostcommonly in March, April or May.This application contain Motherspoems in Urdu.Main features:- You can download the designs you likethe most to your smartphone or tablet. If you want to, you caninclude them as wallpaper or background.- You can share as manyimages as you wish with that special person: your mother. You cando this via social networks, instant messaging apps, SMS oremail.We hope you enjoy this app. If this is the case, we’dappreciate it if you could review/rate it in a positive way, thiswill help us continue updating it with better features and newdesigns. Perfect for Mother's Day!Status for Mom/Mother/Grandmother.Endearing, humorous, funny, and just downright loving. Find theright words to appreciate your Mother!Mother Status App Feature ::*You can copy your favourite status by just one click and share itvia any messenger application. * View next Status by flip yourfinger. * Mother Status having amazing HD UI Design. * Best andunique status provide in this application. * This app is offline sothere is no need of internet connection for it and user doesn'tneed to find on internet because various type of status areprovided in it.Feel free to drop us your feedback to help make theapplication even better. We'll try and get back with new and betterfeatures soon as possible. Hindi Nursery Rhyme Meri Maa Pyari Maa Video Songs. Collection ofBal Kavita Hindi Poems of nursery rhymes meri maa. Learn nurseryrhymes with lyrics and different action step dance.Nursery Rhymesare on Meri Maa Hindi Poems for Class KG 2. Meri Pyari Maa Poem inHindi for toddler education. Baal Kavitayen Audio and video is of OMaa Meri Maa Pyari Maa Lyrics.Meri Maa in Hindi language actionsongs for studies of UKG class. Oh Maa Meri Maa Pyari Maa to learnnursery rhyme poem with lyrics and action for school kids.Meri MaaPyari Maa Dance Performance on Hindi Bal Kavita Video. Meri MaaWritten Song will help your son and daughter study. Emotional SadPoem on Maa in Hindi.Meri Maa Song Hindi Rhymes for Sr KGKindergarten. Mama Meri Maa Pyari Maa Mama full song balgeet iswith cute expressions. ABCD 2 Maa Teri Chunariya Song video.MeriMaa Pyari Maa with Lyrics for LKG & HKG Bal Mandir Babies. MeriMaa Pyari Maa Mujhko Teri Dua Chahiye song video. Meri Maa HindiSong with video.Maa Meri Maa Pyari Maa Mama Guitar. Maa Meri MaaPyari Maa Mama female version original music poem is in Hindi. MeriMaa full song instrumental and other various version style.Meri MaaPyari Maa Mama Full Song Hd. Meri Maa Meri Maa Pyaari Maa dub stepcomplete remix style. Hindi Poem on Mother for small girl and boy.Yaariyan Meri Maa song full video.Meri Maa Pyari Maa poetry forplay house competition. Nursery Rhymes in Hindi on Maa recordedwith spellings. Maa Meri Pyari Maa Lyrics to read Junior KGchild.Maa Meri Maa Pyaari Maa Mumma song male version is in Hindi,Urdu and English languages. Meri Maa Lyrics in Hindi to learneasily for examination.Ma Meri Ma Pyari Maa Mumma song 3d cartoonanimated version. Meri Maa Pyari Maa Song Lyrics for Children Girlsand Boys. Hindi Recitation Poems for Class 1.Meri Maa Video Song oftalking tom cat. Meri Maa Mumma nursery rhyme poem song is forpreschooler. Meri Mummy Pyari Hai Lyrics for learning words.MeriMaa Meri Pyari Maa fast version to listen and sing at anytime. MaaMeri Maa Pyari Maa Lyrics of movie songs.Meri Maa Meri Maa PyariMaa song slow. Meri Maa Videos Song HD video is available here.Meri Maa Pyari Maa Amma video clip of Dasvidaniya.Maa Meri MaaPyari Maa Song for your Baby Kid. Meri Maa Hindi Poem is for HigherKinder Garten. Hindi rhyme cartoon song collection forplayhouse.Maa Meri song lullabies story. Taare Zameen Par Meri MaaVideo Song. Meri Maa Video with Lyrics for Lower KinderGarten.Disclaimer:The content written in this application isavailable in public site. We do not show videos to those websitesor of any modified data. If there is trouble then send email orreport to them for violation reason. Happy Mother's Day. It's android application especialy for"Mother's Day". Everyone had Mother Tell her at least on theMother's Day , How much you love her ? How many time you need her?What's great thing that her do for you ?It's easy to tell her via"Happy Mother's Day" application. Just one touch you can send yourwords to her.Everyday, Everytime, Install Now!Feature• Easy SendMother's Day cards, Mother's Stickers, Mother's Day Quotes to yourlovely dad just touch the picture.• Save your favorite Mother's daycards to your device and put your words too easy.• Set Mother's daywallpapers in 1 step• Live update Mother's Day pictures no requiredto re-installDisclaimer: We do not claim ownership of any pictures.Which have been gathered from the internetIf you belong to anyimage. And want it removed, Please email them to us.We are happy toresolve it as soon as possible.